Trusted Saskatoon Blog | Burnt Orange Trusted Saskatoon IT Experts Talk About Windows End Of Life… Are You Ready? Burnt Orange Trusted Saskatoon IT Experts Talk About Windows End Of Life… Are You Ready? The Trusted team at Burnt Orange Solutions are located in the Saskatoon computers Category. Honesty and respect are important factors in daily communication at Burnt Orange. Gareth and the team at Burnt Orange Solutions are YOUR Saskatoon IT stress solution. Burnt Orange Solutions are your Trusted Saskatoon IT Experts. 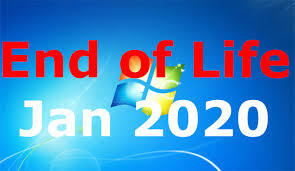 WINDOWS END OF LIFE…ARE YOU READY? Our Saskatoon IT Tips are from the Trusted professionals at Burnt Orange Solutions. We promise to have a one-hour response time for all your Saskatoon IT support needs. Honesty and respect are important to us. In our latest IT Expert tip Article, we discuss the imminent Windows end of life and what happens if you aren’t prepared. Let’s start off with the news that the much-loved Windows 7 operating system has now less than 1 year of life left in it. On January 13th, 2020 Microsoft will cease to provide any further updates or security patches for Windows 7. After this date, Windows 7 will become an ever-increasing security hole in your home or business network. As hackers and criminals find and make use of security gaps in the coding of Windows seven anyone who is still using it will be at greater risk of infection risking data being stolen or made inaccessible. Saskatoon businesses need to plan for the change now. Depending on where you look for the figures, polls show that anywhere between 30% and 50% of businesses still use Windows 7. Depending upon the number of PCs, the complexity of the network and the number of different programs used it could take months to plan and roll out new Windows 10 PCs to a business network. Burnt Orange advice, contact your IT support company now to ensure you are fully secure and using Windows 10 before Christmas 2019. The much-used Windows 2008 Server operating system has now less than 1 year of life left in it. Windows 2008 Server will become an ever-increasing security hole in your business network. As hackers and criminals find and make use of security gaps in the coding of Windows 2008 Server anyone who is still using it will be at greater risk of infection risking data being stolen or made inaccessible. Depending upon the number of servers, the complexity of the network and the number of different programs used it could take months to plan and roll out new Windows 2019 Servers to a business network. Burnt Orange advice, contact your IT support company now to ensure you are fully secure and using Windows Server 2019 before Christmas 2019. This doesn’t mean that your Windows 7 PC or 2008 Server will suddenly stop working, what it does mean is that no more patches or upgrades will be released by Microsoft. It means that every day after January 13th the Windows 7 computers and 2008 Servers will become less secure and more likely to be infect by a virus or become victim to ransomware or other hacking type code. Recovering from a virus attack or ransomware infection is a very expensive operation, so what should your business be doing? Contact our team at Burnt Orange Solutions to discuss planning an upgrade to Windows 10 and Server 2019. Depending upon the age of your PC hardware it may not be necessary to buy new computers, but it will mean server hardware. Early investigation is a must as it can take months to plan and roll out an upgrade depending upon your individual needs. Contact all your software vendors, do the programs you use on a daily basis function in Windows 10 and Server 2019? If not, you are going to either need to upgrade or move to a new software package. This is going to cost your business money, there is no way to avoid it. New computers, new softwares, IT consultants and engineers, possible down time due to the upgrade process, possible business interruption. Plan on changes to your network if you need to keep any Windows 7 PCs or 2008 Servers in your office due to legacy software packages (fun fact – 7% of the worlds computers still run Windows XP), these PC must be kept separate from the rest of the network for security reasons. Burnt Orange Solutions can help your business navigate this necessary evil, whether you have 1 PC or 500. The main take away here is to start the process sooner rather than later!! As 2020 approaches expect many IT companies to be very busy and not have time to fit you in for an upgrade. Don’t be offended if in December 2019 you call a computer support company to discuss the upgrade and all you hear is laughter from the other end of the phone. Contact Burnt Orange today for more information or to take advantage of your FREE initial consultation. View them on Facebook here. They are your Burnt Orange Solutions are Trusted Saskatoon IT Experts!